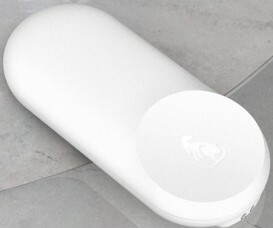 The Kangaroo Motion Sensor is a super easy to install, battery powered, affordable home monitor, with an easy-to-use connected app. Kangaroo wanted to make home security accessible to people of all income levels, without expensive monthly subscriptions, or initial set-up costs. In just a few simple steps, anyone can gain the confidence that their home is protected while they’re out and about. Through the companion app, you can monitor the device on your own for free, or add a professional monitoring plan at a very low cost. The Motion Sensor itself is only $30, and the app is free. All you need to do to get started is to download the app, connect the device via Bluetooth and your wireless network, then stick it to an indoor wall with the adhesive strip on the back. After that, you’re good to go. The device can detect motion up to 15″ away, and at a 60° arc to either side of its sensor. 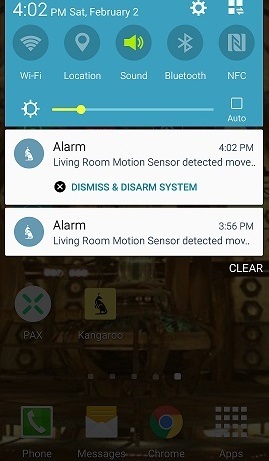 For large rooms, or to monitor your whole house, you can connect up to 20 Motion Sensors through the same app. Each device is discreetly designed, at just 3.55 inches high, 1.55 inches wide, and weighing only 2.37 ounces. By using an adhesive backing instead of screws, the device is easy to relocate, without damaging your walls. 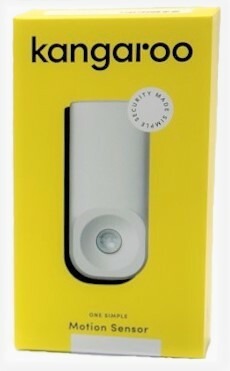 I kind of wish it had a camera, but at this incredible price point, motion detection alone is a great place to start. The 2 AA batteries can last up to 2 years, depending on how often you arm the device and it detects motion. It also has tamper detection, so you will know if your device has been messed with by potential ne’er-do-wells. Don’t worry if you have pets. The device has automatic pet-rejection when it senses motion at a height of up to 2’4″. It will also give you installation suggestions to activate this feature. Your pooch can prowl around your house without making you think you have an actual prowler on the premises. 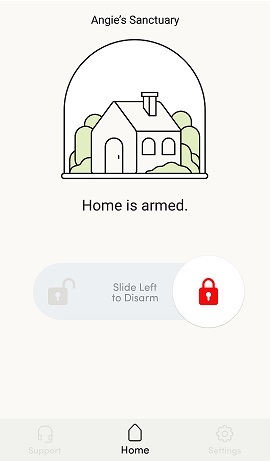 Arm the device using the app as you leave home, then disarm it the same way when you return. 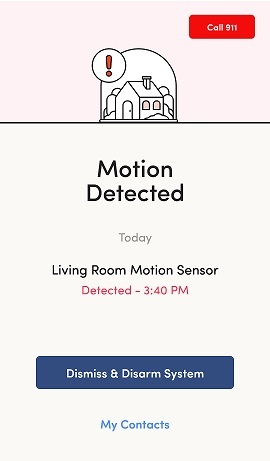 If any motion is detected in your space in the interim, the app will notify you. With the free Basic plan, you’ll get push notifications on your phone, the ability to contact 911 directly from the alarm notification screen, and an unlimited number of users who can be notified in case of emergency. If you want some added features and professional monitoring backup, you can pay a low $9 a month to get the Complete coverage plan, or even less if you pay for a year in advance. This plan will unlock text notifications, voice call notifications, 24/7 professional monitoring, and over-the-phone guidance in case of an emergency. The app can contact the authorities for you, as well as your network of trusted friends and family who can respond to notifications if you cannot. With the Complete plan, you also get Alexa integration, with Google Home compatibility coming soon. You can try the Complete plan for free for 14 days, and cancel anytime, even after the initial trial period. There are no contracts and no change fees, so you can even switch back and forth from the Basic to the Complete at different times of the year. For instance, on a regular basis, while I’m just at work, I might only need the Basic plan, but when I go on vacation for 2 weeks at a time, I may wish to get some assisted monitoring so I can enjoy my leisure time without worry. At the moment, the Motion Sensor is the only product in the Kangaroo line that is available to consumers. 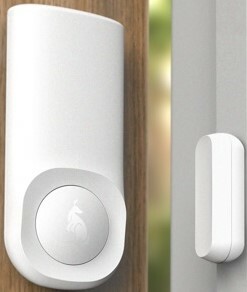 Soon, though, they will be adding an Entry Sensor, which mounts to doors or windows, and alerts you if they’re opened. They’ll also be introducing a Siren, so you can scare intruders away from afar, when either the Motion Sensor or Entry Sensor is activated. 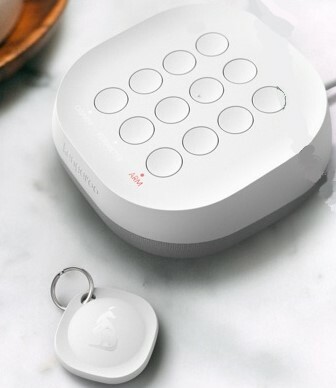 The Siren is also fitted with a keypad and comes with sensor tags, so you can allow any approved house guests to come and go without you having to disarm the device, and will also let you know who is in your home. Finally, there will be a Climate Sensor, to let you know if the temperature or humidity drastically fluctuates inside your house, alerting you to potential disaster. All of these products will work together within the same app, to give you a more robust home security system. Kangaroo‘s Motion Sensor is the perfect product for anyone who has shied away from home security systems due to the high costs of purchase, installation, and subscription monitoring. It gives no-fuss monitoring at a very low cost, even if you choose to get the Complete plan. From first opening the box to having a functioning, connected device on my wall, watching over my apartment, it took only about 5 minutes of set-up. For giving me the piece of mind to know if someone has entered my home while I’m gone, I couldn’t ask for an easier, or more affordable option. 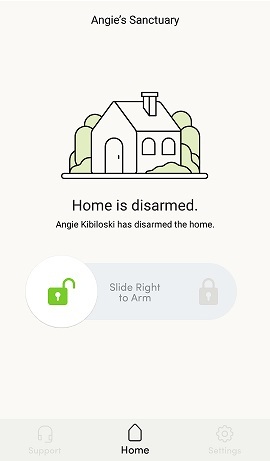 By having this device, you can even get up to 20% off of your home owner’s insurance, and Kangaroo will help you file the paperwork with your insurance company. To get even more information, go to heykangaroo.com. Then, check out the Kangaroo app for Android or iOS.